The rise of open source software has correlated with the rise of the interest. Open source software is openly published source code enabling anyone to copy, modify and redistribute without paying fees. Olivet Institute of Technology (OIT) students have been studying and utilizing open source software in numerous practical applications and course projects. Some of the more popular open source software that OIT students have used includes Apache, Drupal, Eclipse, Linux, FreeBSD, Joomla, Moodle, Tomcat, OpenSolaris and Symbian. OIT is focusing on research in its web technology courses encouraging its students to research and develop real-world applications. This is being demonstrated by several of the OIT projects being developed. In addition, with the emergence of Web 2.0 technology, open source is playing a huge role in developing the software behind it. Recently several OIT students have begun developing open source software for web 2.0 applications, including CMS in PHP, blogs, shopping cart and BBS. 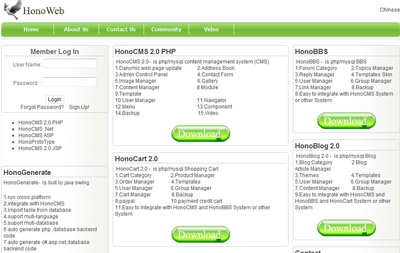 One of these projects, dubbed “Hono” has already gone public and can be accessed freely at http://www.honoweb.net/. The ultimate goal of OIT through these projects is to continue to develop Web technology that can be used for mission and serving the greater Christian community.